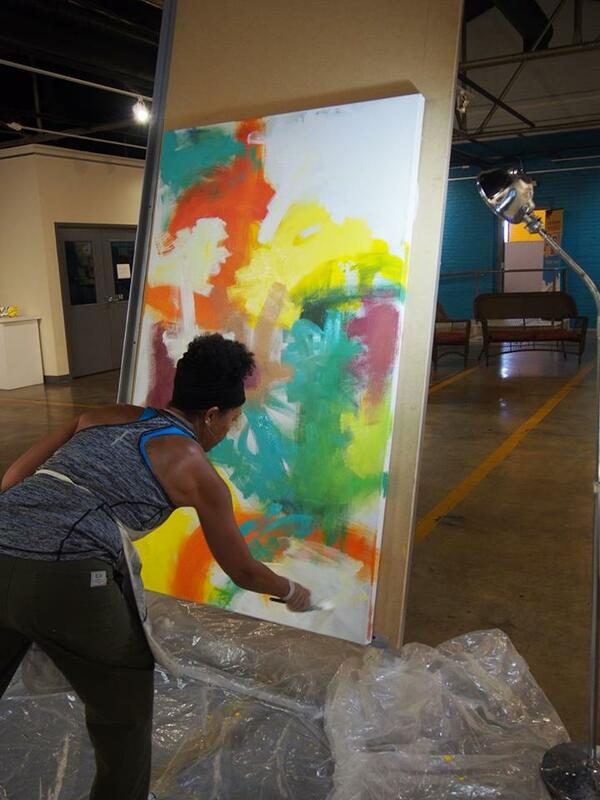 I recreate myself daily by authentically exploring my passion to make art. My road to artistic freedom has been a winding one: After earning a B.A. in Commercial Art, and a decades-long corporate career, I left my 9-5 in 2015. Replacing the office with a full-time commitment to my practice at Clearwater Artist Studios in Concord, NC, has been most gratifying. I’ve resided in Charlotte, NC since 2004. However, my roots stem from five generations of native New Yorkers on my mother's side. Harlem was home. Our family was steeped in the rich Jazz and African-American cultural traditions of that city. My great-grandfather was a jazz (ragtime and stride) pianist and composer, and owned a popular Harlem night club during the 1940s. Jazz not only significantly influenced the African American New York community. Progressive artists such as The New School of abstract expressionists, were also inspired by The Music. This expansive energy significantly impacted my formative years through the 1960s. Two years into my full-time practice, the Women in Abstract Expressionism show came to Charlotte’s Mint Museum. I was blown away! It became clear that inside of this amazing creative process that channels emotional states was my opportunity to experience a freedom that had eluded me for decades. Inspired either by preconceived concepts or raw impulse, I begin by making random marks on the canvas. As the composition develops, I make adjustments to areas that make me uncomfortable. The process is repeated layer by layer as I respond with free-sweeping gestures that emanate from Spirit. This unusual painting method is direct. It essentially channels spiritual, subconscious and emotional memory into visual form. Oftentimes, creating a pleasing composition requires turning chaos into order using both additive and subtractive methods. The process is both healing and freeing as I work with oil, or various forms of acrylic paint, art crayons and sometimes tissue on canvas or fabric. The result IS the experience itself. I am always surprised by the images that demand (and succeed) to be expressed! As I continue to expand through this introspective work, my hope is that the work motivates contemplation, conversation, and perhaps - personal growth. In addition to earning a B.A. in Commercial Art from The City College of New York (CUNY) - I’ve studied at F.I.T. (New York City), The School of Visual Arts (New York City), Central Piedmont Community College (Charlotte, NC) - and independently with artists Louise Farley, Lee Baumgarten, Walter Stanford, and Steve Aimone.